TLC Carpet & Tile Cleaning offers cleaning services for scrubbing, stripping and re-coating vinyl floors. 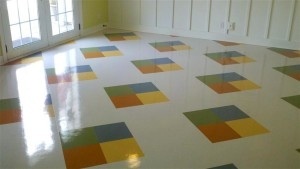 Sheet Vinyl and VCT (Vinyl Composition Tile) comes in either 12×12 inch squares or rolls. The process for maintenance is similar; however, some sheet vinyl does not require maintaining with floor finish. Sheet Vinyl is most often used in areas where seams are not desirable such as medical offices. Cleaning vinyl floors needs to be done as often as 1 year depending on traffic. The finish will protect the floor and give it a beautiful finish appearance. Ongoing maintenance programs: This can be anything from a daily service program to an annual strip and re-coat tailored to customer’s needs and expectations.Daily or weekly service includes: Sweeping and mopping, auto scrubbing and high speed buffing.Scrubbing and re-coating: Involves periodic deep scrubbing to remove top layer of floor finish and then additional coats of finish applied to extend floor life.Stripping and re-coating: Involves infrequent removal of all floor finish and sealer followed by several coats of sealer/finish re-applied.Consulting: Pacific gives expert opinion and helps with problem solving with leading tile manufactures and installers. TLC Carpet & Tile Cleaning offers a variety of other cleaning services that include carpet cleaning, janitorial cleaning, specialty floor coatings, and even water restoration. Call on TLC Carpet Care proudly serves Castle Rock, parker, Franktown, Elizabeth, Kiowa, Sedalia, Larkspur, Lone Tree, Highlands ranch, and Centennial CO.